Forecasters warn 2019 is expected to be one of the hottest years of all time. The Met Office estimates average global temperatures for 2019 will be 1.10C above pre-industrial levels, putting it among the five hottest years ever. It is close to the record-breaking 2016, when temperatures were 1.15C above the 1850-1900 period. The Met Office said the highs are the result of climate change caused by greenhouse gases. 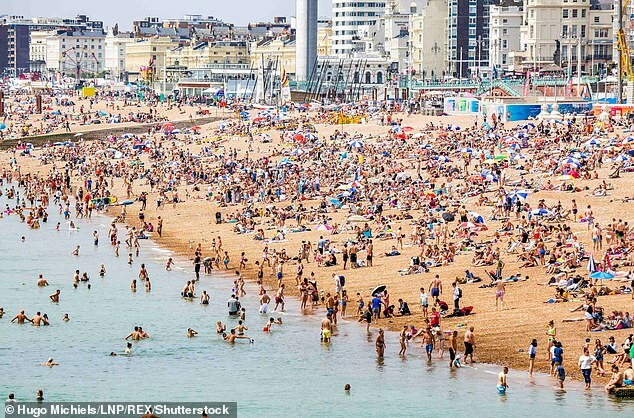 This summer was the joint hottest on record for the UK, with the year’s average temperatures around 0.96C above pre-industrial levels. One of the hottest years of all time? Among the five hottest years ever? Does whoever wrote this drivel not know that the Met Office’s measurements of global temperatures only started in 1850? Apparently that was when the world began. Do they not know that 1850 was at the end of the Little Ice Age, when global temperatures plummeted? 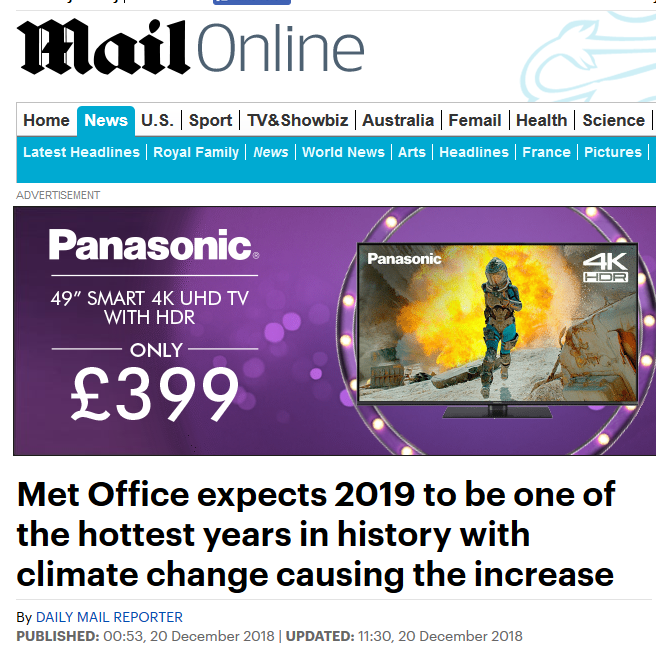 Then, to make matters worse, the Mail conflates last summer’s heatwave ( a weather event far from unprecedented) with global climate. And finally, they manage to illogically predict that next summer will also be a scorcher, even though the UK has gone through a decade of disappointing summers. 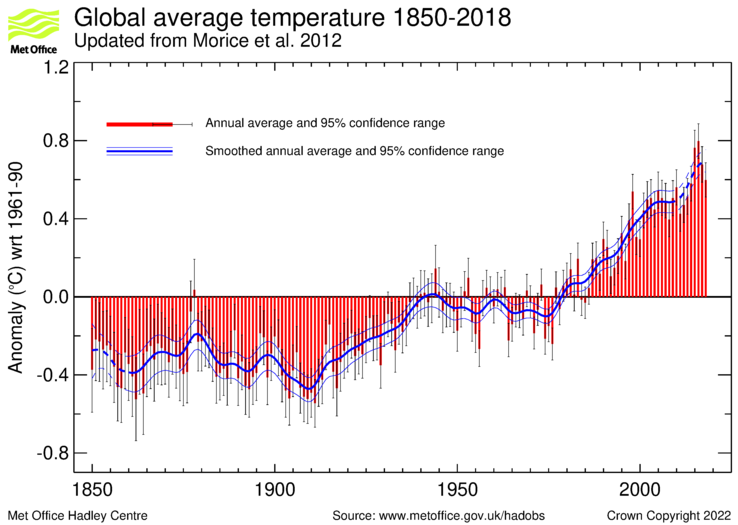 And as the Met Office figures themselves show, global temperatures have been rising steadily since around 1910, long before AGW had any effect, with a mid century temperature drop coinciding with the cold phases of the AMO and PDO. As for the Met Office’s forecast itself, they predict a temperature anomaly next year of anything between 0.98C and 1.22C above “pre-industrial” levels. But what they fail to point out is that temperatures are still artificially high because of the lingering effects of the record El Nino of 2015/16, as there has been no major La Nina activity since to offset it. Such a wide margin of error makes the whole thing pretty much useless anyway. But I would suggest that there would be much greater concern around the world if the Met Office was forecasting temperatures were going to return to the “normals” of pre-industrial times!